This image is enlarged from a synthetic negative made from soot. 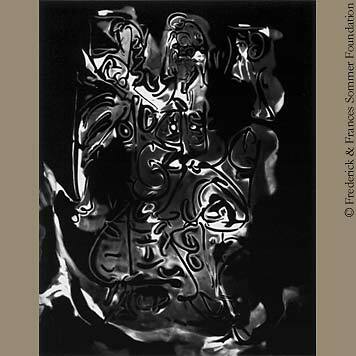 The process began with Frederick Sommer making a drawing in aluminum foil, which was then held over a smoking candle to collect soot. The soot-covered drawing was transferred, like a relief print, to a piece of grease-coated glass. Sommer over the years sooted either, and even both, the convex and concave sides of foil drawings to take advantage of all the possibilities.